Click picture to play video – opens in new window. Angelus ad virginem / Gabriel fram evene king played on medieval harp with new variations by Ian Pittaway based on medieval musical principles. Nicholas, a character in Geoffrey Chaucer’s The Miller’s Tale of The Canterbury Tales, is a very naughty boy. 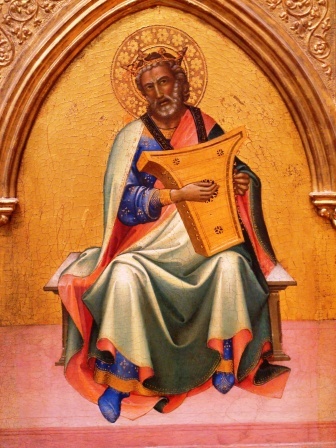 He is also a singer and a player of the psaltery, a wire-strung plucked medieval instrument. Written at the end of the 14th century, Chaucer has Nicholas sing and play Angelus ad virginem, 100 years after its first surviving appearance. All the sources for Angelus ad virginem are ecclesiastical books, and this is reflected in the way it is referenced in The Miller’s Tale, as Nicholas is the Clerk of Oxenford, i.e. the teenage scholar or ecclesiastical student of Oxford. His clothes-press was covered with a coarse red cloth. Very often blessed was his merry throat. Supported by his friends funding him and his income. And pleyeth faste, and maketh melodie. And plays fast, and makes melody. … but it is clear that his singing and playing of the devotional Angelus ad virginem is an act of religious hypocrisy. At the end of the story, Nicholas gets Chaucer’s own brand of justice. Nicholas farts in the face of Absolon, who also desires Alisoun, and in return Absolon smites Nicholas “amydde the ers” – in the middle of his arse – with a hot iron. 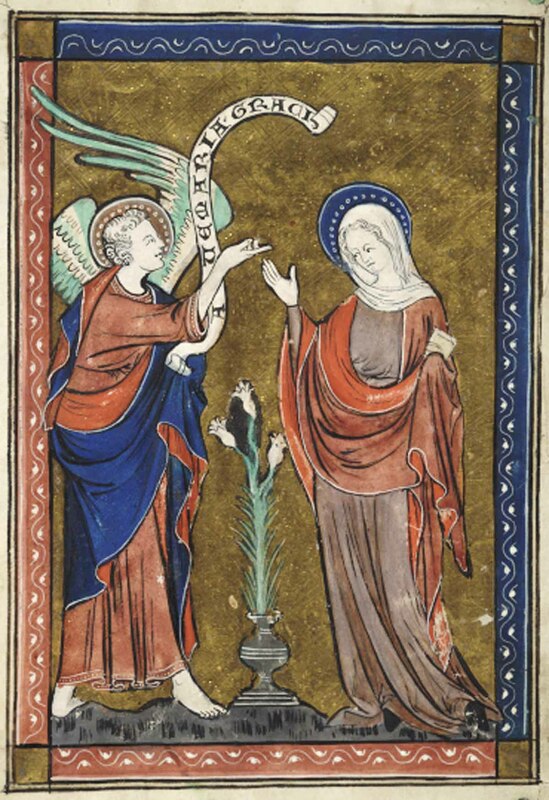 Angelus in virginem in the Arundel 248 manuscript. The Latin words of Angelus in virginem tell the story of the annunciation, the visitation of the angel Gabriel to tell the Virgin Mary the news that she is immaculately and miraculously pregnant, as told in The Gospel of Luke 1: 26–38. The earliest extant source, the late 13th century English manuscript Arundel 248, has the words of Angelus in both Latin and Middle English. The layout on the page shows unambiguously that this was already a song with a version in two languages when the scribe picked up his pen. Since Latin was the language of faith, it is safe to assume that the Latin is the original and that the Middle English words of Gabriel fram evene king were a later creation. Though the verses of Gabriel tell the same story as Angelus in the same order, and each verse has roughly the same thematic content, Gabriel is not a direct translation. The first verse of each, both rendered in modern English, will suffice to make the point. 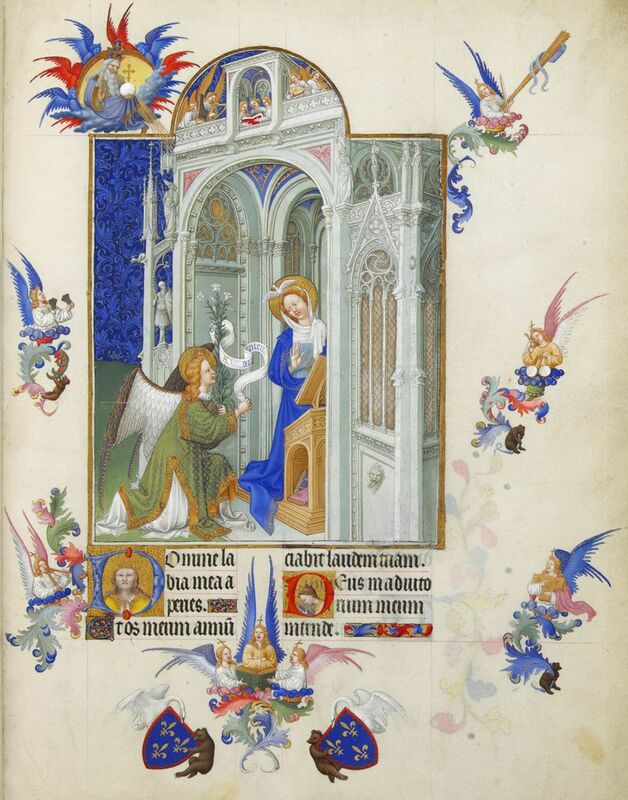 The annunciation as depicted in Cambridge University Library MS Dd 4.17, f. 5v, 14th century. heil be thu ful of grace ariyt. of sen and devles miyt. Free from impairment are you, full of grace indeed. of sin and the devil’s might. 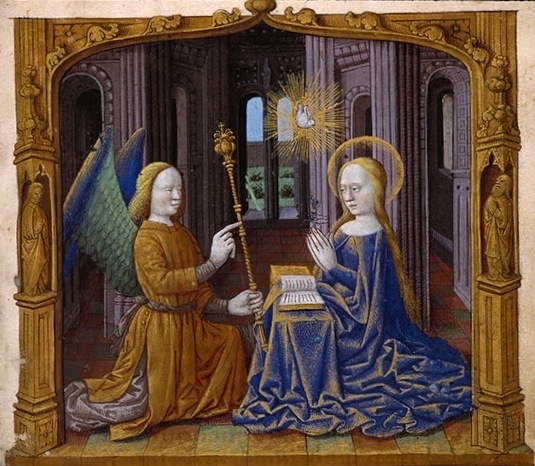 More prosaically, in neither version is Mary given a name – in Latin she is “virginem”, in Middle English, she is “maide sweete” and “maide briyt” – and the angel in Latin is simply “angelus”, whereas he is named “Gabriel” in Middle English. In the earliest extant source, then, we already see an attitude of adaption and change in the lyric. There is no sense of an ‘original’ which has to be revered and preserved like a museum piece. When we trace the history of the music, we see the same is true. 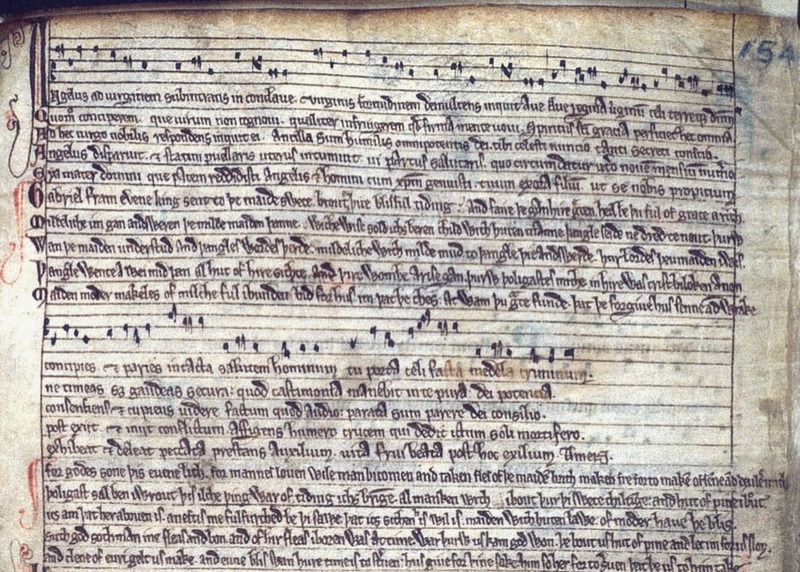 The earliest source of music is the same as that for the words, Arundel 248, an English manuscript from the end of the 13th century. It has a monophonic melody with words in Latin and Middle English, as we have seen. Now in the British Library, the manuscript may have been associated with the Cistercian abbey of Kirkstall, Leeds. The next manuscript chronologically has text only, and was destroyed in World War II: MS Metz 535, from the end of the 13th or early 14th century, originating in the Benedictine monastery of Saint Arnould in Metz, northeast France. Angelus in virginem in Cotton fragment XXIX. The next in time had a narrow escape from destruction. British Library Cotton fragment XXIX is probably from Adel, now Addle in Yorkshire. It is from the collection of antiquarian Robert Cotton, born in 1571, who had started collecting manuscripts, books, Roman inscriptions and medieval coins by the age of 18, building a huge collection. In 1731 a fire broke out at Ashburnham House, Westminster, where the Cotton manuscripts were being stored temporarily. Some items were completely destroyed, others damaged, including Cotton fragment XXIX. This fragment, fortunately, is still mostly readable. 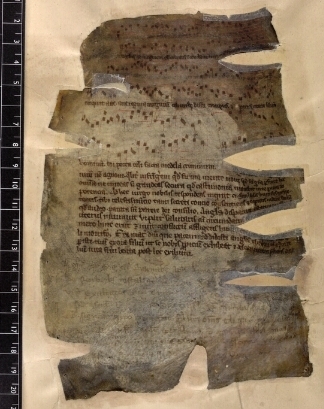 It is dated 1349 on the bottom of the recto (front) side, but Angelus on the verso (front) side seems to be earlier and has been dated to as early as c. 1300, due to the notation being written in the earlier style of ars antiqua, the ‘old art’ or ‘old technique’, with less rhythmic precision than ars nova, the ‘new art’ or ‘new technique’, which flourished from the 1310s until the 1370s. It is difficult to be sure because, as with all technical innovations, the spread of more precise notation was uneven. Though Arundel (c. 1290s) seems to be a little earlier than Cotton (c. 1300 or 1349? ), Arundel is written with clear rhythmic precision, lacking in Cotton. The Cotton fragment has two polyphonic voices in Latin, the melody easily recognisable as related to the Arundel tune, but not identical. It is safe to assume the changes came about as a result of being carried by the oral tradition, the most common medieval way of transmitting music. The Dublin Troper’s version of Angelus ad virginem, written in 3 voice polyphony with the main melody in the middle voice. Next is a parchment plainsong book, Cambridge University Library MS Add. 710, dated to c. 1360 with later additions. This is the Dublin Troper, belonging originally to Saint Patrick’s Cathedral, Dublin, a troper being a medieval book containing tropes or sequences of music for singing additions to pre-existing chants in the Mass. In the Dublin Troper there are three versions of the music: at f. 127 it is monophonic with a Latin text; at f. 130v there are 3 voices with no text; and at f. 130r there are 3 voices with a Latin text. The melodies are related to but not the same as the two previous surviving versions. Next is Cambridge University Library MS Gg.1.32, dated to the 15th century, with a Latin text. That there is no music appears to be an implicit testimony to the oral tradition: the music is presumably lacking because the melody was known and memorised, not so the words. The final version is the text in the Cluniac Missal, printed in Paris in 1550, the Cluniacs being a Benedictine monastic reform movement and a missal being a book of liturgy for the Mass. In summary, Angelus / Gabriel is carried in written sources from the late 13th to the mid 16th century, in England, France and Ireland, testament to its popularity and longevity. We have six versions of the melody and six manuscripts, but one is not equal to the other: the words and music are unevenly distributed among the manuscripts and not all sources have both. The Latin texts show linguistic errors that seem to indicate that they are textually related, but other errors indicate independence and an oral tradition. None of the versions of the music agree with each other and they all vary in different ways, showing that no variant is dependent on another. The best explanation is that all versions were transmitted in the oral tradition before being variously committed to writing. As we would expect in the oral tradition, there are significant differences in the music without obscuring their relationship to each other. There is striking similarity between the ecclesiastical oral tradition that carried Angelus / Gabriel and the oral folk tradition, the transmission of songs by word of mouth, the chief means of communicating music around the world until the 19th century. As we have seen with Angelus / Gabriel, the oral tradition carried songs and melodies over great geographical distances from person to person; carried material which evolved and changed over decades and centuries; eschewing any idea of a pristine ‘original’ to be preserved, embracing the accretions of being passed on and passed down; and thriving in times and cultures where oral communication of music predominated over writing. In late 19th and early 20th century England there was a sense of cultural shift. Some recognised the devaluing and wiping away of music-making that was traditional, participatory, communal and orally transmitted, in favour of music as a consumer-bought commodity, passively observed by a watching audience, with value put on the latest novelty rather than the connected chain of longevity. Such dedicated people as Cecil Sharp, Maud Karpeles, Lucy Broadwood, Ralph Vaughan Williams, Sabine Baring-Gould and many others therefore made it their work to visit rural towns and villages, and later urban workhouses, to collect as many traditional songs as possible while the people who sang them still lived. Since so many of these song informants were at an advanced age, the song collectors were quite right in thinking that once these people died, their songs would die with them. Many of the singers complained that no one was interested in their songs any more, that it had been years since they had sung them, and they were delighted that collectors such as Sharp were taking an interest. Folk song collectors, left to right: Cecil Sharp, Maud Karpeles, Lucy Broadwood, Ralph Vaughan Williams, and Revd. Sabine Baring-Gould. The folk song collectors did an invaluable service. Their old singers were no passive consumers of music, but active participants and remoulders of songs, recreating them, consciously and unconsciously changing a word here, a sentence there, forgetting and adding verses, reshaping the melody in subtle or fundamental ways, just as we see in the evolution of the Angelus melody. The folk music collectors discovered the evidence of this traditional process in song after song. For example, in 1923 Cecil Sharp visited William Pittaway in Burford, Oxfordshire, and collected from him 10 songs. Among them was a unique version of Barbara Allen, with 2 verses recorded nowhere else, and a tune in no way related to other melodies for the song. What William sang as Barbara Ellen was first referred to by Samuel Pepys in his diary 257 years earlier: the “little Scottish tune” in his entry of 2nd January 1665 (1666 by the modern calendar). After becoming popular in the 17th century as a printed broadside, Barbara Allen became one of the most widespread traditional songs, with multiple sets of variant words and widely different melodies found by collectors in England, Scotland, Ireland, the USA (98 versions in Virginia alone), Canada, Italy, and Scandinavia. A reprint of The sorrowful Lover’s Regrate: or, The Lowlands of Holland from 1776, now in Edinburgh Library. The same singer, William Pittaway, also sang Cecil Sharp a version of The Lowlands of Holland, which he sang as The Low Low Lands of Holland. This also started life as a broadside, The sorrowful Lover’s Regrate: or, The Lowlands of Holland, in an English print of 1760, and continued to be popular in the oral tradition and on printed broadsides until the 20th century. There are a huge variety of words and tunes for this widespread and enduring song, including completely different scenarios and even different ideas as to where Holland might be: it is variously hot or cold, fertile or barren and, in some, Holland even has sugar cane. In some versions, Holland seems to have become New Holland, the name given to Australia between 1644 and 1788. The same process of a song’s musical evolution through oral transmission, seen with Angelus in the late 13th to mid 16th century, and with broadsides which became folk songs in the 17th to 20th centuries, is also seen in the songs of the troubadours and trouvères, lyric poets and song writers of southern and northern France respectively in the 11th to 14th centuries. During this period their large body of songs and poems was committed to writing, and from these manuscripts we see that many of their songs existed in different versions showing significant melodic variations. This is the case, for example, with the troubadour song Kalenda maya – May Day. Its melody in a manuscript written in western Provence in c. 1300 (Paris, Bibliothèque Nationale, fonds français 22543) is clearly related to but not identical to a trouvère song, Souvent souspire mon cuer – Often sighs my heart – in a Parisian 14th century manuscript (Bibl. l’Arsenal MS 5198). The verses of the two songs are on the same theme – she is beautiful, I am hopelessly in love with her, she doesn’t want me, I am heart-broken. Their melodies are recognisably similar, though different in some details, a feature best explained by oral transmission, the chief means of musical communication in the middle ages. Medieval music was an improvising tradition. Very often only the basic music, a monophonic line, was written down, and it was the mark of a master musician to be able to add to it, enrich it, improvise on the theme, add another polyphonic line. This was the case with both secular and religious music. In the video at the top of this article I have treated Angelus in just the way the various medieval arrangers did, as my starting point for creativity. This version of the melody is from the middle voice of the Dublin Troper at f. 130r and the variations are based on musical ideas from other medieval material, such as the repeated high note drone in the last section of the English estampie in the 13th–14th century manuscript, Douce 139, now in the Bodleian Library, and a quote from the melody of the mid-13th century trouvere song, Ce fut en mai – It was in May, as the basis for variations. The message from the multiple versions of Angelus, then, is that we have to be creative with the music, just as medieval musicians were, just as traditional musicians were and still are. 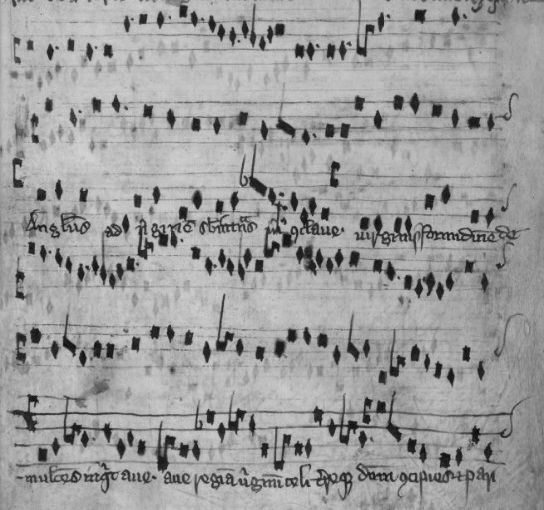 In medieval just as in traditional music, a tune or song will grow and develop as it is passed on, and musicians are the active participants in that process. This means that the written music handed down to us is not an unyielding monolithic blueprint but it is, within the rules of the genre, a flexible framework within which we are invited to reinvent. I cannot remember whether we discussed this when you came to Lewes, but have you thought about Edi Beo Thu as the parent for the Morris tune Constant Billy and William and Nancy, the Napoleonic ballad “The Death of Parker” and the Welch song “The Ash Grove”? I make that something like 800 years of tradition! For many years, “Angelus Ad Virginem” was the first piece of music sung at the annual Bracebridge Dinner, a lavish Christmas feast held at the Ahwahnee Hotel in Yosemite National Park. It was sung as the guests entered the dining room. This piece of music was selected by Ansel Adams in 1929, who was director of the pageant at that time.